But why Marie Antoinette? Why don’t we, for example, read “Is This Female Politician the New Madame Victoire?” in our headlines? 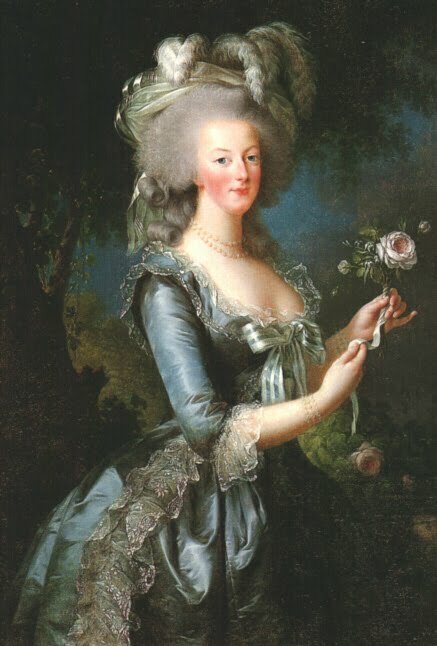 Interestingly enough, the reasons for the insistence of “Let them eat cake!” sticking to Marie Antoinette may be those same reasons that calumnies against Marie Antoinette made during the revolution stuck to her so hard that they were considered evidence at her trial. In the 20th century—and in particular, in the 1930s—Marie Antoinette was once again being transformed in the eyes of the public. But instead of a transformation into a harpy-like she-beast or a hated bloodthirsty Austrian by caricatures and satirical pamphlets, Marie Antoinette was transformed into a glittering, dazzling queen who was capable of capturing public attention in a big, big way. She was not just a queen who was executed during the French Revolution, the constant subject of romantic 19th century biographies. She became the tragic but oh-so-frivolous queen who wore gauzy ball gowns on book covers, whose memory sold replica earrings to housewives and who engaged in a dramatic, love-torn affair with a dashing count in a major MGM motion picture. She became the French queen, the queen associated with French history, with the downfall of the monarchy. How could Madame Victoire, Maria Theresa, Madame Sophie or any other royalty to whom the phrase has been latched compare?